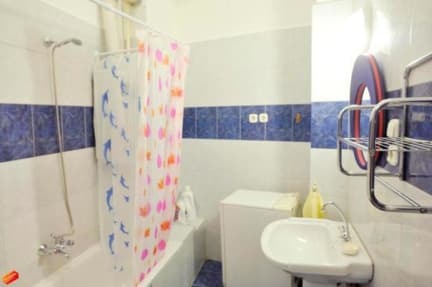 Zsofi's House Hostel v Budapest, Maďarsko: Zarezervujte nyní! Non of the rooms have bunk beds! All our rooms have either a stunning view of one of our most beautiful theaters or other old buildings. Besides we have four shared bathrooms, four toilets, two big, fully equipped kitchen and two common rooms. The staff is very friendly, helpful and happy to guide you through your stay. We are organizing traditional Hungarian culinary course, bike- and scooter tours. 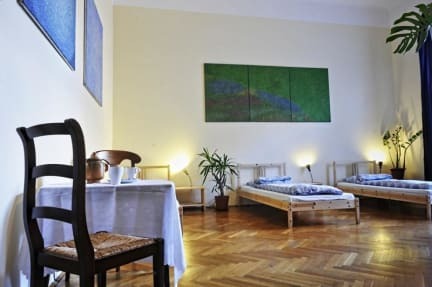 This is what you can find at Zsófi´s House: free fridge, free hair dryer, free and clean bed linen, free towels, free Wi-fi, free lockers, free tea and coffee, washing machine, reading lights, hot water, elevator, no bunk beds, no curfew, balconies, wake up service. And open hearts and minds. but you can leave your luggage here before 2pm and after 10 am if needed. No smoking at any time inside of hostel. No age-, gender-, religion-, ethical-, sexual orientation restriction.